Makes four 4"x2" bars or eight 4”x1”. In a non stick frying pan set on hot (you need to react quickly in this, so seeing exactly what’s going on is important – hence a frying pan rather than a saucepan!) sprinkle the ideal sweetener and let it sit for a minute, then add heavy cream and coconut oil. Stir and incorporate well. Then add cinnamon/flavor drops , and incorporate well too. Never stop stirring this! Let it come to a bubbling point. When it’s all bubbling, add the chopped nuts and now you just need to keep on stirring and incorporating again, within another minute or so, you well get a really nice toasted/caramelized nut aroma. Add the lecithin and stir in. Now sprinkle on the protein powder and be ready to stir it all in very quickly. It will all tighten up like it does with caramelizing sugar. Cook for maybe 1 minute at most. From this point on, NEVER stop stirring for even a second. It can burn really quickly! Your nuts should now look pretty much like you would expect from a honey caramel coating. A little glossy and very sticky. If it’s too soupy , add more nuts. If it seems dry and not coating everything in a sticky "mess", add a tiny bit more heavy cream. VERY little though … it goes a long way! Take it off the heat and pour into a small casserole dish or greased loaf pan. Grease the back of a measuring cup and press your nut mix down evenly. Let it cool completely. Cut into 4 – 8 bars (I find 4" x 1" more than enough as a portion!) and let them sit, loosely covered on the counter for 2 or so hours. Drying them a little seems to help the "holding together" process and it makes them less sticky on the outside! Then wrap individual bars in wax paper or plastic wrap. 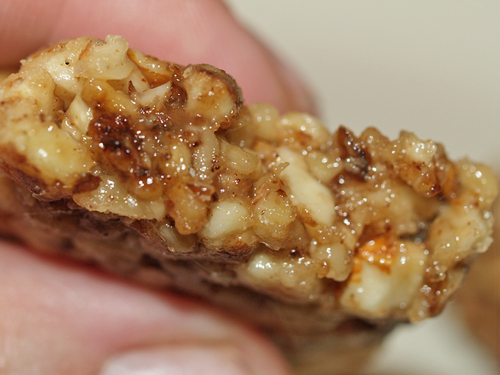 They seem to hold together pretty well, even though they are a little more "droopy" than a regular granola bar. This entry was posted in Recipe, gluten free, low carb. Bookmark the permalink. The lecithin keeps it all moist and sticky inside, so by omitting it the bars may not stick well after the first day or two.